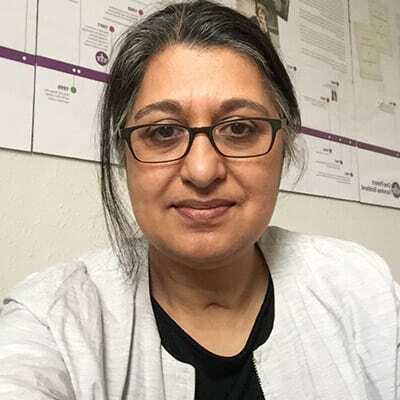 Satwat Rehman is the Director of One Parent Families Scotland (OPFS), an organisation that works to support single parents and their families through the delivery of services, advice and information, influencing and policy work. She has been its Director since 2011. Satwat has more than 25 years’ experience in the voluntary and public sector in Scotland and England, working in the fields of equalities, education, employability, economic development/regeneration and early years and childcare. She has also been active in anti-racist campaigns and movements for social justice since 1989. Since joining OPFS in 2011, she has been a member of a number of commissions and advisory groups such as the Commission for Childcare Reform, Fairer Fife Commission, Dundee Fairness Commission, the Scottish Government’s Ministerial Advisory Group on Child Poverty, and the Scottish Government’s Early Learning and Childcare Strategic Forum. She is on the boards of Children in Scotland and Families Outside. She has recently become a Fellow of The RSA (Royal Society for the encouragement of Arts, Manufactures and Commerce) whose mission is to enrich society through ideas and action. Satwat lives in Edinburgh with her partner and two children aged 16 and 13.